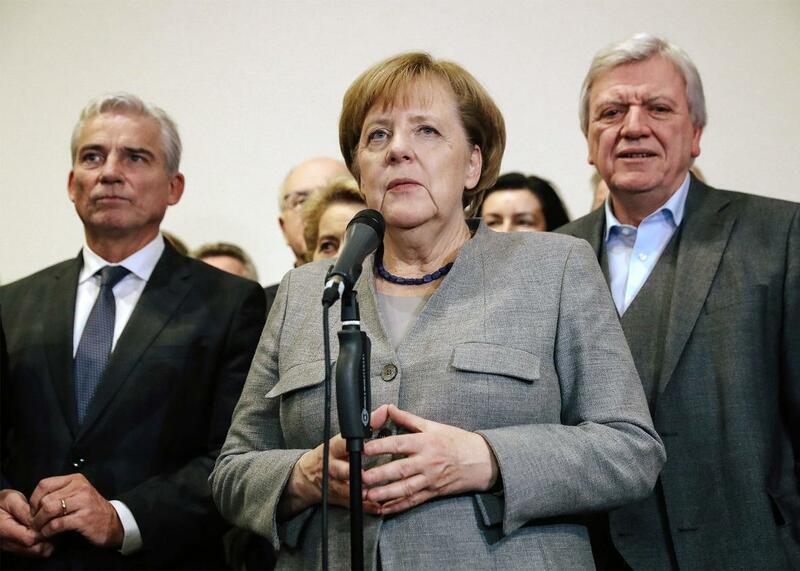 German Chancellor Angela Merkel speaks to the media in the early hours Monday in Berlin, after preliminary coalition talks collapsed following the withdrawal of the Free Democratic Party. It is astounding how quickly politics has descended into chaos on both sides of the Atlantic. Thanks to Donald Trump and his merry band of mall predators, the United States is, of course, still in a class of its own. But the chaos has quickly spread to other countries as well. Britain is hurtling toward a hard Brexit under the leadership of a terminally weakened prime minister. Spain is in the middle of a standoff between Madrid and Barcelona that has seen democratically elected politicians imprisoned and the prospect of large-scale civic strife in the heart of Europe grow more likely by the day. Populists are headed for big advances in Italy, have celebrated stunning successes in Austria and the Czech Republic, and are busy assaulting democracy in Poland and Hungary. The one country that seemed to be exempt from much of this chaos was Germany. Until a few months ago, right-wing populists were not even represented in the country’s parliament, the Bundestag. Columnists around the world quickly promoted Angela Merkel to the honorific position of true leader of the free world. What a wonderful piece of historical irony, one article after another purred, that the country that had twice thrown the world into chaos over the course of the 20th century has turned out to be the last beacon of stability in the 21st. When Germans went to the polls in September, the far-right Alternative for Germany tripled its share of the vote. With 12.6 percent, it became the country’s third-biggest party. Including the post-communist Left party, nearly a quarter of the seats in the Bundestag are now held by populists who are inimical to basic democratic norms (and also happen to have a very close relationship with Putin’s Russia). This should have put to rest any idea that Germany is immune to the age of populism. But it still looked likely that Merkel would stay on as chancellor for another four years. When her Christian Democrats entered protracted negotiations to form an unlikely coalition government with the pro-business Free Democratic Party and the socially liberal Greens, the general assumption was that they would ultimately strike a deal, Merkel would stay in power, and Germany, at least for the time being, would continue to be a guarantor of stability. Sunday night, Christian Lindner, the young, charismatic, and scarily slippery leader of the FDP, announced that he was backing out of the negotiations. After running a shrewd election campaign in which he positioned the party to Merkel’s right on immigration, Lindner was unwilling to strike a compromise that would have allowed refugees with legally recognized status to bring their spouses and children to the country. Lindner’s public—and most likely premeditated—break with Merkel shows just how toxic the issue of refugees has become in Europe. While the openly xenophobic populists of the AfD are still far from power, they have succeeded in setting the agenda. Like Sebastian Kurz, Austria’s new chancellor, who is currently in talks to form a coalition with that country’s far-right Freedom Party, Lindner is clearly hoping to rise to greater power and prominence by putting a respectable face on the anger that has propelled far-right populists into parliaments across the continent. This doesn’t bode well for the long-term direction of German politics: After many years in which establishment parties were very careful to keep a clear distance from the far right, it now looks increasingly likely that the country’s conservative parties will radicalize once Merkel leaves the stage. Just how soon will that be? We will find out in the coming weeks. For now, there are three likely scenarios. First, the coalition between Christian Democrats and center-left Social Democrats that governed before the election still retains a healthy combined majority in parliament. After winning just a miserable 20 percent share of the vote in September, the Social Democrats vowed to leave government and regroup in opposition. But now that yet another edition of the “grand coalition” between Germany’s big traditional parties is the only realistic road to a stable government, party leaders may well change their mind. In the short run, this would be the best solution to the country’s political crisis. The ideological distance between Christian Democrats and Social Democrats is manageable. Though the government would undoubtedly be uninspired, it would indeed guarantee the stability for which other countries look to Germany. And yet, the long-term consequences would likely be terrible. The Social Democrats would be likely to do even more poorly in 2021: As their Dutch, French, and Irish comrades have demonstrated over the past few years, it is perfectly possible for center-left parties that once took around 40 percent of the vote to fall to single digits. For that reason, the party leadership seems to be sticking to its promise not to enter a renewed coalition with Merkel. Second, Angela Merkel could attempt to form a minority government. This would allow her to stay in office for the time being, and to cobble together a parliamentary majority for urgent legislation, like the federal budget, on a case-by-case basis. This option would also be far from ideal. For one, Germany would no longer be a guarantor of stability: Since minority governments are prone to fall at any moment, Merkel would for all intents and purposes become a lame duck overnight. For another, any remaining hope that Merkel might partner with Emmanuel Macron to push through much-needed reforms of the European Union would be dashed. Third, if the Social Democrats refuse to join a coalition with Merkel, and she is unable or unwilling to cobble together a minority government, the country may be headed for new elections at the start of 2018. Out of a set of bad options, this would be the worst: Populist parties are already chomping at the bit to exploit the past weeks of chaos and dysfunction in a new round of elections. And even if the AfD does not manage to improve its last showing, recent polls don’t give any reason to think that a different, more ideologically coherent coalition would be able to win an outright majority. More likely than not, establishment parties would thus be faced with an even more stark version of their current dilemma after the next round of elections. Over the past year, a lot of my American friends have waxed lyrical about a European system of proportional representation. If the United States had the same electoral system as Germany, they told me, a Trumpist party would at most have 20 to 25 percent of the vote. By working together, more moderate forces could easily contain them. There is something to their logic. It is indeed true that somebody as extreme as Donald Trump could only have won the American presidency because of a winner-take-all system coupled with historical oddities like the Electoral College. But this doesn’t mean that the alternative is that much more functional. As the German crisis reminds us, systems of proportional representation face their own problems once populists gain in popularity. The most noxious of those may be the fact that ideologically coherent coalitions become impossible. This forces establishment parties to make the same choice over and over again: Either they are willing to form a government with their erstwhile ideological rivals on the other side of the moderate political spectrum. Or they refuse to make compromises and leave the country without a stable government. The populists win either way: The first choice reinforces their argument that all establishment parties are the same. The second reinforces their argument that the establishment is dysfunctional and needs to be replaced. This holds a lesson for America as well as Germany. While our political system is in desperate need of fixing, it will ultimately take more than a change of the electoral system to halt the populists. In the end, we need to vanquish them on the battlefield of ideas—not by changing the rules of the game, but by winning back the trust of a large majority of the population.